This is it. It's here... our LAST summer before we enter our "schooling" years! And honestly, I couldn't be more excited. In fact, I wouldn't mind at all if we just skipped July and went straight to August (talk to me mid-October and I may be singing a different tune). After one year of private school at three, and two years of "preschool homeschooling" at four and five - our oldest, Micah, turns six in September and will finally, officially be registered for Kindergarten! I will still be doing preschool with our 4 year old, Hannah, but Micah will be the only one reported to the state this year, so it definitely feels more "official." If you've been following our journey so far, you know that we have felt called to homeschool in this season. I went through every level of indecisiveness about this for years, and now I'm fully committed and confident that it's the best decision for our family. I could list all of the reasons out for you, and I may do that in a future blog post, but for now - if you are curious and have any questions for yourself about this option, please feel free to message me privately or comment below! I would love to try and help encourage you to do what God is leading you to do for your family, whatever that looks like! But for this post, specifically, I wanted to talk about how we chose our curriculum for this upcoming school year. First off, let me say, I knew nothing. Sure, I have heard the terms "Abeka" and "Saxon" thrown around whenever the homeschool conversations came up. But for the most part, I entered this homeschooling journey with no personal experience. So I relied heavily on the internet as my guide. I welcomed any and all suggestions from friends, compiled a list together and then did my research! These are special days we live in, where we have no shortage of information at our fingertips, so this was actually, really time-consuming! Youtube was probably one of my favorite resources. Being able to see the curriculum and hear straight from the people who have used it, helped a ton! Last year, my research led me to start with a literature-based curriculum called Sonlight. This was a really great starting point for us and it was worth the money alone in books! But I realized pretty quickly that my children - like most four and five year olds - enjoyed keeping their hands busy. We only lasted about two months following their schedule, until I scrapped it and just started doing my own thing. I thought I would need a schedule to keep me accountable (because "winging it" comes a little more naturally for me) but, I realized I already have a huge accountability built into me as their mother. I WANT them to learn. So however it happens, whether we do 2-3 hours of bookwork one day and 30 minutes the next day - you can be sure this mama's gonna make it happen! Once I had gathered together a list of some of the top curriculum companies recommended to me - this is where I got overwhelmed. There are SO many good choices out there! How would I ever know which one would be just right for my children? I started by looking at the state requirements for Kindergarten and then making a list of subjects that I knew I wanted to cover. I categorized each curriculum option under each subject. Doing this helped me visually see that I had a TON of recommendations for language arts curriculums but not that many for math, for example. It didn't seem as overwhelming to choose our Math curriculum, once I saw the shorter list. The next step is important for our family - getting our money's worth. 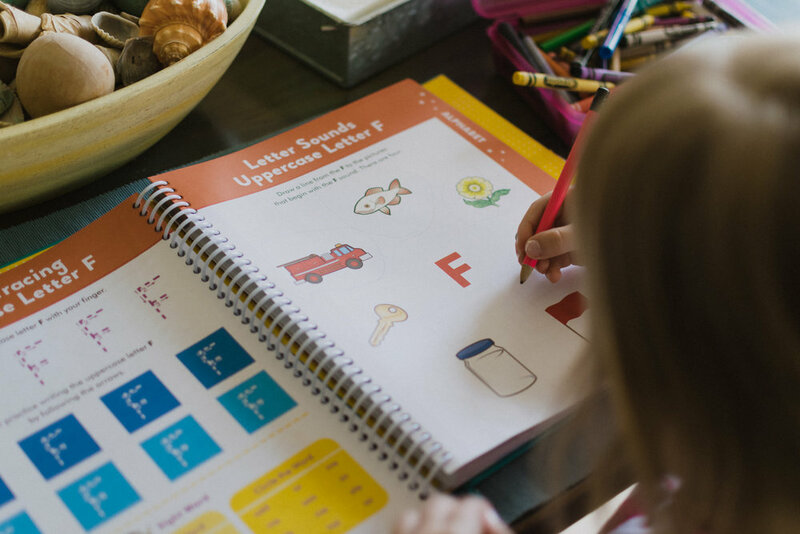 I think cost is a major factor for most families choosing to homeschool (since they often have to sacrifice one income) and thankfully homeschooling can be done on the most simple budget! There were a few companies that stood out to me specifically because of cost. I absolutely loved that the number one recommended curriculum to me this year, was also one of the most affordable! I also discovered that our top choice for a math curriculum offered a pastor's discount, so that pretty much solidified that choice for us too. I love that this Language Arts curriculum incorporate: phonics and reading, spelling, grammar and punctuation, literature and art all in one! I ordered the Level K course set for Micah and the Level K Primer for Hannah. They will only be one school grade apart, so it will be fun to teach them both at a very similar pace! This program also comes with mp3 songs to teach them the days of the week and months of the year (we've only listened to them a few times and my kids already have them memorized!) So fun! This is a newer curriculum and was recommended to me by SO many people, so I'm super excited to try it out! The great thing about homeschooling is that I can work at the pace of each child's learning. I know a lot of experienced parents have told me not to rush the preschool and kindergarten years - that they learn mostly through play. And we plan to incorporate lots of art and crafts, explore days and music into our everyday life. Anyone who knows me, knows that those things come most naturally to me anyway! But my children ask to sit and do workbooks nearly every day (they don't care that it's summer!) so we go with it. I never want to stifle their love for learning. This is why I choose curriculum - to keep track of progress and stay on course. Each year we can evaluate and next year may look differently. These are fun times! And I'm so thankful to have the opportunity to get to do this schooling thing with my favorite little people. One of the things that nobody tells you when you welcome your first baby, is that soon you will be sending him off to Kindergarten. It happens fast. I remember bringing our first son, Micah, home from the hospital like it was yesterday. I remember lying in bed that night, amazed at the incredible miracle that just happened to us - we became parents! There was no looking back now. We were in this for life. For better or worse. Whatever came our way, we had someone else to think about and care for. The overwhelming responsibility that comes along with parenting hits every one a little differently, I'm sure. Depending on whether having a child was in the "plans" for you at the time. I can tell you just from my personal experience that, planned or not, children carry with them more weight than the seven or eight pounds they are born with. This weight was felt almost immediately for us. We were told only days after Micah's birth that he may need open heart surgery by the age of 6-8 weeks old. A decision that seemed completely out of our hands, still required us to do what we only knew best to do - pray. And by God's grace, that surgery wasn't needed. Our responsibility as parents doubled quickly, when we had our second baby only a year and a half later. Our daughter, Hannah, was born at sunrise, and with her came a whole new set of parenting skills required. It was like we knew nothing - even though we had already done this once and not too long ago. But the truth is, every child really is different. And as parents, we have the unique privilege of knowing those differences and teaching, correcting and nurturing our children in a way that will be best for them. Part of my goal in parenting over the last five years, has been learning about and getting to know my children. They are developing and changing everyday. Some days, I think I almost have them figured out and then other days, I'm sure I don't. This second-guessing has carried over into pretty much every important parenting decision I have to make. And most recently, the decisions I have to begin making about their education. Some days, when I'm feeling particularly creative and intentional, I'm certain that I will homeschool them. And other days, I wrestle with myself about this for hours on end, driving me to the point of complete exhaustion. And then, when I've finally collapsed into a puddle of worthlessness on the floor, I'm certain that they never need to stay home full-time with a lunatic like me. Unless of course, homeschooling is exactly what they need. And then I will pour myself into making every ounce of their education my duty and goal. I will rise above the problems and challenges, because that's what God created me to do when He made me their mom. If the decision could just be made for me, I think to myself, then I would do it. And in a way, when we moved to Jacksonville, it kinda was. Josh and I both grew up with different educational backgrounds - he was homeschooled all the way through high school and I was a poster-child for public school and even had the safety patrol badge and "Top D.A.R.E. Student" T-shirt to prove it. Of course, the conversations on what we would do with our children's education was brought up long before we even had children of our own. He shared the benefits and challenges of homeschooling from his perspective, and I shared the benefits and challenges of public school from mine. After so many conversations, still neither of us could conclude, for certain, which option would be best for our family. We did settle on the fact that we would prefer private school over public school. But we knew, ultimately, it was our job as parents to teach them the truth about God's Word and not the school. So when we moved to Jacksonville, I began looking into schools in the area and researching options for us if we were to go the private school route. It blew my mind. I'm not sure what I was expecting because, truthfully, I don't have much experience with how much education costs. But I never imagined that the cost of schooling elementary students would rival that of college universities! I know, there is never a price tag you can put on your child's education, but STILL, $10,000 a year for schooling is just a little above our budget (and by a little, I mean A LOT). So just like that, private school became out of the question for us. Unless, I got a full-time job. And while I do have a Bachelor's degree, my skill set and experience are mostly freelance and creative. The one "grown up" job I had right after I graduated college? Music and Art Teacher. Perhaps, God was preparing me for this the day I accepted that teaching job. Maybe there was a reason I came home from school every day as a child and taught my little sister everything I was learning. God had placed in me a desire to teach. But it was my own insecurities of failing, of being mocked, of choosing to school my children in a way that looked different than the majority of the world, that kept me doubting. I still remember the day I called Josh and told him I was ready to accept the calling to homeschool. I had prayed about it, and felt a peace that this was the best decision for our family, I told him. Are you... sure? I heard him say over the phone. He must be remembering all those days I ended up as a puddle on the floor... and would call him, sobbing. "Of course, I'm sure." I told him confidently. " I truly feel called to do this." And that was how our decision to homeschool was made. Not flippant. Not without tears. Not with a disdain for any other method of schooling. Or disrespect for any parent that chooses to follow a different calling on their life. I can guarantee you that every parent I have talked to, no matter what decision they ultimately choose, has struggled through it. Because we do what we have to do for our children. And for this season, this is what we feel we need to do for the benefit of our family. The beauty of this decision, is that it could look differently in another season! There are endless possibilities to what the future may hold, and I can never say for certain what tomorrow will bring (James 4:13). But I will say, there are definitely benefits of homeschooling that I am truly excited about! No strict schedules (although, I do plan to have some structure), Fridays can remain family days, we can travel any time of the year, I have the freedom to incorporate as much music and art as I like, shorter "class" time and more play time, NO HOMEWORK, and maybe the best benefit for my little mama heart right now... I don't have to send my baby off to Kindergarten.